AMDC Law has launched an all new, revamped website. AMDC Law has launched a completely revamped website. The redesigned site reflects AMDC Law’s focus on high quality service and innovation. The site is designed to allow the visitors to discover the various legal services offered. One of the reasons for a redesign was to create a site that would provide broad information to the public in an efficient way. The site makes it easier for existing and potential clients to navigate and find information on the firm and its professionals. The site also provides useful information on the countries and territories where AMDC Law is active in. 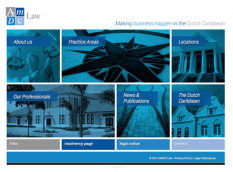 Having a location in Aruba and Curaçao, AMDC Law lawyers are also active in St Maarten, Bonaire, St Eustatius and Saba. Containing practical information on the professional services provided and applicable experience, the website is the perfect starting point when searching for practical and innovative legal solutions. AMDC Law invites all to visit the renewed website at www.amdclaw.com.